TOTTORI - When scattered wreckage believed to be the remains of the Imperial Japanese Navy battleship Musashi, which was sunk during World War II in the Philippines’ Sibuyan Sea, was found earlier this month, it sparked interest in the site and the legendary vessel. An increasing number of people have visited the grave of the ship’s captain and a museum dedicated to the vessel, while related books have been selling well. Relatives of crew members who perished in the sinking and people with connections to the warship hope the renewed interest will help convey the experience of the war to the next generation. The Musashi and its sister super-dreadnought, the Yamato, were Japan’s biggest warships and among the largest battleships ever built. An increasing number of people are vising the museum at Mitsubishi Heavy Industries Ltd.’s shipyard in the city of Nagasaki, where the battleship was built. More than 50 items are on display, including a model of the Musashi. The number of visitors has been on the rise since Microsoft co-founder Paul Allen said he had found the warship. Before the news broke of the discovery, the museum had 15 to 20 visitors a day, but that number increased to more than 60 at one point. Visits to the museum’s website are also up. Many people are visiting the grave at Tozenji Temple in the city of Tottori, where Vice Adm. Toshihira Inoguchi is buried. Inoguchi was the last captain of the Musashi. 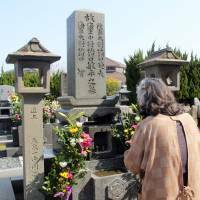 According to Takao Kaneda, 59, the head priest of the temple, the grave had not been well known. Only members of the Maritime Self-Defense Force and those who are related to the Musashi had visited the grave. Since the news that the wreckage was found, more people, mostly seniors who experienced World War II, have visited there with food offerings to pray for him. “I hope (news of the ship’s discovery) will help younger people know about the war,” Kaneda said. Shipments of the book “Battleship Musashi” by the late Akira Yoshimura, which is regarded as a masterpiece, jumped between March 1 and March 18, according to publishing house Shinchosha Co. Some bookstores in Tokyo ran out of their stock. Sales of plastic models of the Musashi have also jumped, said a spokesman for Tamiya Corp. Relatives of the dead sailors hope the rekindled interest in the warship will help convey the experience of war.